The age-old guidance of buying low and selling high has appeared to escape the halls of Yahoo!. If we ignore the Microsoft and Yahoo! acquisition dance of 2008, which ended up in Yahoo! 's staying independent, but losing dramatic market capitalization, search market share, and accelerating an employee exodus, both voluntary and involuntary, it's still clear the company intends to wring all the remaining value out of its vestigial pieces before selling - effectively promising low to no returns on every deal. Yesterday's news leaked that Yahoo! had plans to kill or spin off a number of Web services, including Delicious, Alta Vista, MyBlogLog and others. Given the abandonment and mismanagement of these properties, this is not too surprising. Alta Vista's mismanagement goes back more than a decade. In 1999, I wrote a story (this is pre-blog, so I'd love to say "post") on Internet Valley's Web site about how Compaq was not leveraging Alta Vista after they acquired Digital Equipment Corp. (See: Warning: Compaq is On the WWWarpath) The site is a shell of its former self, once being my go-to search site. But Delicious is what has everyone up in arms, as the company was among the first Web 2.0 darlings, and is still widely used, as the Web's definitive bookmarking site. I've personally tagged more than 3,000 items in the last few years, most of them capturing external links to the blog. Yahoo! has managed to take a site with a deep bench of fans, considerable use, and make it obvious they would love to give it away. It's not even clear if anybody really works on it any more, or if it's just being maintained by the company's techies. 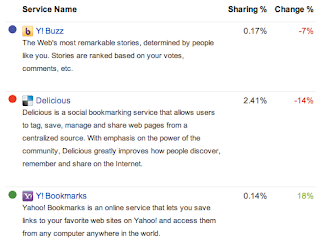 On this background, both Web traffic stats and sharing statistics from third party sites show the party long since ended at Delicious. Compete, whose traffic graphs are anything if not suspect, still manages to display some trendlines right, showing a decrease in traffic of nearly one half in the last year. 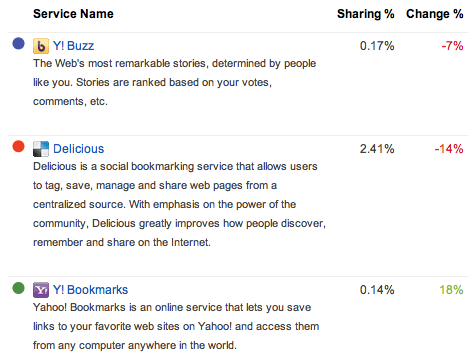 In parallel, AddThis, the social sharing site, shows decreased Delicious bookmarking, down by 14% in the last three months, the fastest declining site of its kind on the service. The moves Delicious has made have been odd or delayed. The long-awaited "New Delicious" was way behind schedule, and recent bumps made sharing to external services even more difficult. It's as if the company wanted to punish the users it had left. If you want to get a fantastic return on a sale, the best time to sell is when you don't have to, when things are going fantastic and you have real momentum. Yahoo! has essentially telegraphed to the world that it wants to ditch Delicious to someone, anyone. But the catch is, its users already started ditching it themselves. Buy high, kill.... sell. That's the wrong order of things, Yahoo!.